The Control of Asbestos Regulations 2012 apply to employers, employees, self – employed persons and duty holders and cover all work with asbestos containing materials. Regulation 10 of CAR states that every employer must ensure that adequate information, instruction and training is given to employees who are liable to be exposed to asbestos. This includes maintenance workers and others who may come into contact with or disturb asbestos. The course consists of 4 modules with questions at the end. 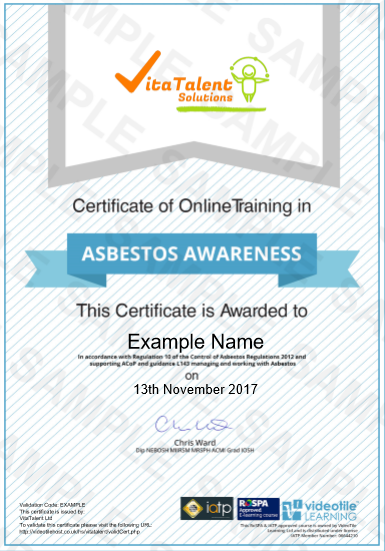 The modules cover areas such as recognising asbestos, where it is used, minimising the risks and legislation about working with asbestos. Instant Certification on completion of all modules and you are given the chance to review all your answers at the end of each module before final submission and you will be given 3 attempts at each module to achieve a pass rate of 100%.